AS St. Paul’s Churchyard is probably the oldest ground built upon in London, we begin our perambulations in that quarter. The cross which formerly stood north of the cathedral, and of which Stowe could not tell the antiquity, is supposed by some to have originated in one of those sacred stones which the Druids made use of in worship; but at least it is more than probable that here was a burial-ground of the ancient Britons; because when Sir Christopher Wren dug for a foundation to his cathedral, he discovered abundance of ivory and wooden pins, apparently of box, which are supposed to have fastened their winding-sheets. The graves of the Saxons lay above them, lined with chalk-stones, or consisting of stones hollowed out: and in the same row with the pins, but deeper, lay Roman horns, lamps, lachrymatories, and all the elegancies of classic sculpture. Sir Christopher dug till he came to sand and sea-shells, and to the London clay, which has since become famous in geology; so that the single history of St. Paul’s Churchyard carries us back to the remotest periods of tradition. The first authentic account of the existence of a Christian church on this spot is that of Bede, who attributes the erection of it to King Ethelbert, about the year 610, soon after his conversion by St. Augustine. The building, which was probably of wood, was burned down in 961, but was restored the same year—a proof that, notwithstanding the lofty terms in which it is spoken of by the old historian, it could not have been of any great extent. This second church lasted till the time of William the Conqueror, when it, too, was destroyed by a conflagration, which burned the greater part of the city. Bishop Maurice, who had just been appointed to the see, now resolved to rebuild the cathedral on a much grander scale than before, at his own expense. To assist him in accomplishing this object, the King granted him the stones of an old castle, called the Palatine Tower, which stood at the mouth of the Fleet River, and which had been reduced to ruins in the same conflagration. The Bishop’s design was looked upon as so vast, that “men at that time,” says Stowe, “judged it wold never have bin finished; it was then so wonderfull for length and breadth.” This was in the year 1087; and the people had some reason for their astonishment, for the building was not completed till the year 1240, in the reign of Henry the Third. Some even extend the date to 1315, which is two hundred and twenty-eight years after its foundation; but this was owing rather to repairs and additions than to anything wanting in the original edifice. 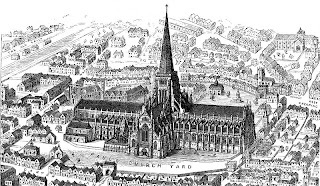 The cathedral thus patched, altered, and added to, over and over again, with different orders and no orders of architecture, and partially burned, oftener than once, remained till the Great Fire of London, when it was luckily rendered incapable of further deformity, and gave way to the present. It was, indeed, a singular structure, and used for singular purposes. “The exterior of the building,” says an intelligent writer, himself an architect, “presented a curious medley of the architectural style of different ages. At the western front Inigo Jones had erected a portico of the Corinthian order; thus displaying a singular example of that bigotry of taste, which, only admitting one mode of beauty, is insensible to the superior claims of congruity. This portico, however, singly considered, was a grand and beautiful composition, and not inferior to anything of the kind which modern times have produced: fourteen columns, each rising to the lofty height of forty-six feet, were so disposed, that eight, with two pilasters placed in front, and three on each flank, formed a square (oblong) peristyle, and supported an entablature and balustrade, which was crowned with statues of kings, predecessors of Charles the First, who claimed the honour of this fabric. Had the whole front been accommodated to Roman architecture, it might have deserved praise as a detached composition; but though cased with rustic work, and decorated with regular cornices, the pediment retained the original Gothic character in its equilateral proportions, and it was flanked by barbarous obelisks and ill-designed turrets. The shrowds and cloisters under the convocation house, ‘where not long since the sermons in foul weather were wont to be preached,’ were made ‘a common lay-stall for boardes, trunks, and chests, being lett oute unto trunkmakers, where, by meanes of their daily knocking and noyse, the church is greatly disturbed.’ More than twenty houses also had been built against the outer walls of the cathedral; and part of the very foundations was cut away to make offices. One of those houses had literally a closet dug in the wall; from another was a way through a window into a wareroom in the steeple; a third, partly formed by St. Paul’s, was lately used as a play-house; and the owner of the fourth baked his bread and pies in an oven excavated within a buttress. 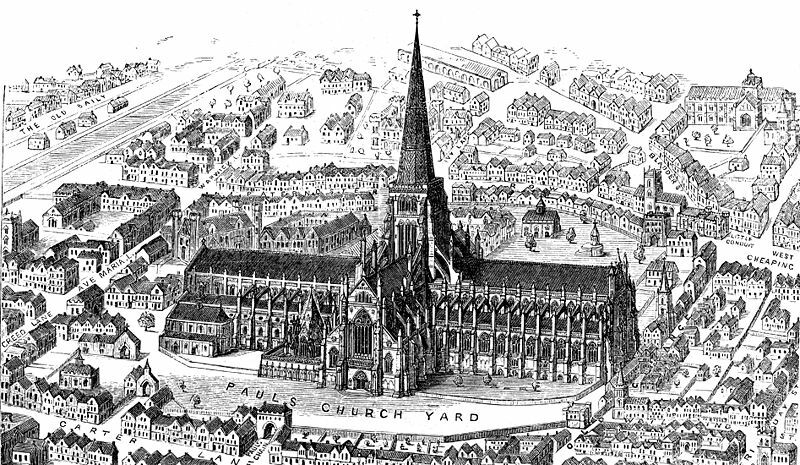 Old St. Paul’s was famous for the splendour of its shrine and for its priestly wealth. The list of its copes, vestments, jewels, gold and silver cups, candlesticks, etc., occupies thirteen folio pages of the Monasticon. The side aisles were filled with chapels to different saints and the Virgin; that is to say, with nooks partitioned off one from another, and enriched with separate altars; and it is calculated, that, taking the whole establishment, there could hardly be fewer than two hundred priests.